Walkie-Talkie is an easy to use offline Voice and Instant Message Chat app for iPhone and iPad supporting up to 8 users. No Cellular network is required. It connects nearby iPhones & iPads and uses any existing Wifi or Bluetooth connection for extended range. It connects to all Apple devices running the same App in the immediate vicinity without being connected to a network. No Cellular network is required. The App will re-use any existing Wifi connection to connect to peers on the same network, but will also connect devices which are not connected to any Wifi Network as well. The App can be used like a Walkie Talkie using Push to Talk (PTT) functionality to send voice messages between each other or additionally be used to send textual messages. Group camping or jungle tracking in a remote area where there is no reception. During a disaster, flood, hurricane, tornado, earthquake and etc. Mass protest where there is a possibility the government will cut off the internet. When your monthly mobile data plan expired. 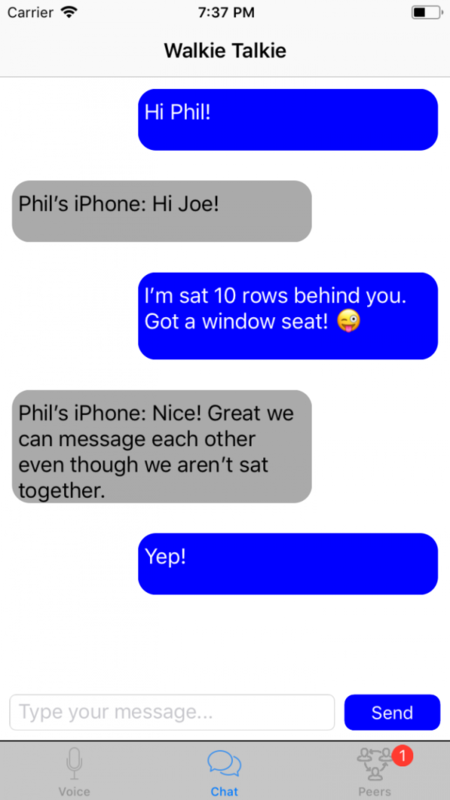 In an airplane or bus when you and your friend are not seated together. End of the world, during a Zombie apocalypse or in a war zone. When connected with others running the same App, you can share voice messages by tapping and holding down the microphone and recording. When you release the microphone your voice message is sent to all connected peers. In addition to voice messages, you can use the chat function to exchange messages with others. No Wifi? No problem! The multipeer connectivity features in iOS allows peer to peer connections to establish over nearby devices using Bluetooth or ad-hoc Wifi. Range varies 100-200ft depending on obstructions. If you enable Airplane Mode on your device by default all radios will be disabled. In order to continue to use the App whilst Airplane Mode is enabled you can selectively re-enable Wi-Fi and Bluetooth (airline permitting). 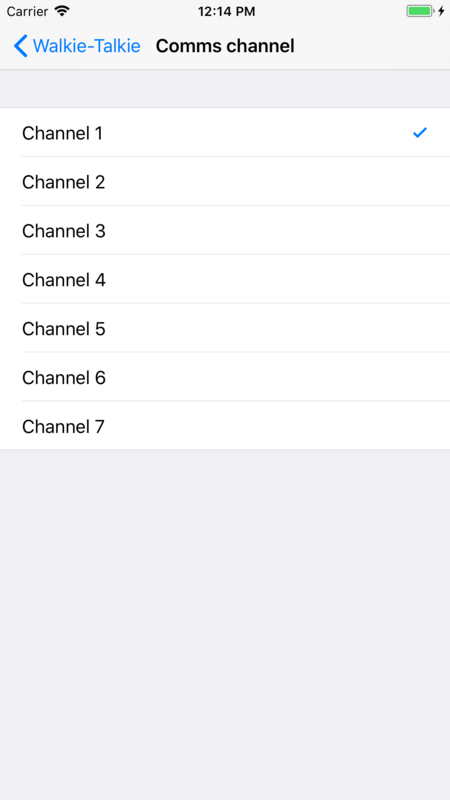 There are 7 available channels to choose from within settings. When the App starts, it will automatically connect to users on the same channel. Share a channel with your mates. You can also choose a nickname to use whilst in the App. The first time the App starts, if you’ve not configured a nickname it will use your iOS device name. The nickname is used to identify peers sending chat messages. All iOS devices supporting iOS 11 can be used with the App.